Intel announced the Atom processor in 2008. That same year we were introduced to the first two members of the family: Diamondville and Silverthorne. The chips were both called Atom, but they differed in their application. Diamondville was used in desktops, nettops and netbooks, while Silverthorne was almost exclusively for MIDs (Mobile Internet Devices). Atom continues its split personality. Silverthorne begets Moorestown, the next-generation Atom for MIDs and smartphones. Diamondville, on the other hand, leads us to Pine Trail - the next-generation Atom for desktops, nettops and netbooks. Pine Trail is the platform codename. Pineview is the codename for the new Atom CPU. Pineview takes the same 45nm Atom architecture introduced in 2008 and integrates a memory controller, DMI link and GMA 3150 graphics core. Integrating the memory controller is extremely important for Atom as it continues to be an in-order architecture. With minimal options for reordering instructions on the fly, if Atom encounters a load the pipeline stalls while the memory request completes. Despite Atom’s sensitivity to memory latency, most synthetic tests showed a minimal improvement in memory latency from Pineview. The real world performance benefit is also less than expected but tangible, but for whatever reason that’s not manifested in any synthetic memory latency tests. More on this shortly. 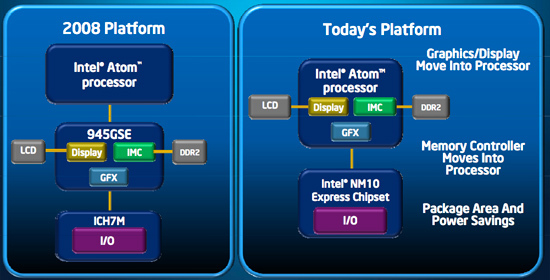 The chips being announced today are the Intel Atom N450, Atom D410 and D510. The N450 is the lower power netbook version of the new Atom and is a single core processor. Intel claims that only single core Atom processors will be offered in netbooks, a limitation that may be lifted at some point in the future but no time soon. Intel seems intent on keeping netbooks from being too high performance, or even just less miserable than they would be with a single core Atom. The D410 and D510 are for desktops and nettops. They are single and dual core versions of the new processor, respectively. The netbook version of Pineview only supports a maximum of DDR2-667 and according to Intel's datasheet can only support at most 2GB of memory. Its TDP is nearly half that of the desktop/nettop version. The first dual core Atom processors were just two single core Atoms on a single package. 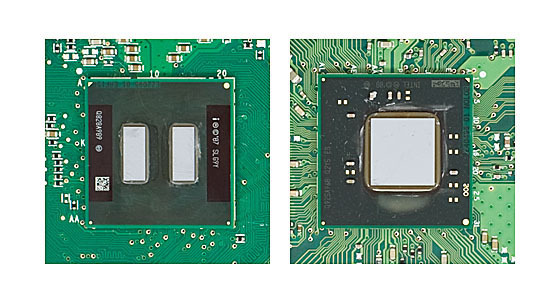 Pineview dual-core is monolithic because both cores have to share the same memory controller. "Granted the board only costs $75 new, but would it have killed Intel to include DVI or HDMI out?" "It’s not a problem in areas where AMD is competitive, but what about areas in which they’re not?" AMD chose not to be competitive on the Netbook and lower power notebook market. There was a time when ATIs IGPs were very good, and today an overclocked 3200 can dish out enough fps to compete with NVIDIAs offerings. AMD had a lower power CPU months before the CLUVs, but it never become an integrated platform like Ion, even on the micro HTPC market. If a company has a super IGP, and there was a time when AMD had one, and the market has a new wave of low power low costs Netbooks, and this company decides not to join the wave, well, dont blame Intel when things go the way of the Dodo. AMD still offers the AMD Neo X2 with AMD 785G or HD4200 graphics or with embedded AMD 780E + SB710 chipset. But that's not a netbook offering but a consumer or ultra-portable low-power notebook offer. I don't really like it that it's K8 based but it's still not totally bad. I don't think AMD is interested in the MID/smartphone market Intel is going after slowly any way. I won't consider the Nano until they have shrunk it, made it less power hungry, made it dual core and released a good graphics chip with truly open source drivers. I'd rather have Pineview + Broadcom BCM70015 if not. Yeah I know you wrote that. But..
That will never happen. It's Nano + Mobile ATI/NVIDIA GPU tops. But I don't see the point. Via's own gpus are fine for DXVA in Windows etc. Nano aren't that power efficient to begin with. It's not like such platforms will be fast enough to game on either way. Almost no performance gains - the opposite is actually true with the demise of useful chipset graphics for the atom platform.